We have Quality chicken medications and products that prevent chicken disease. Based on information from Bird vet Dr Alex Rosenwax. The source of the lead that we suspect in our Melbourne back yard chooks is soil contamination from lead paint, car batteries, sump oil and leaded petrol, and building materials like nails and screws.. Fig 1) The in house chicken blood lead machine at The Melbourne Chicken Vet. Lead affects multiple body systems leading to variable clinical signs. 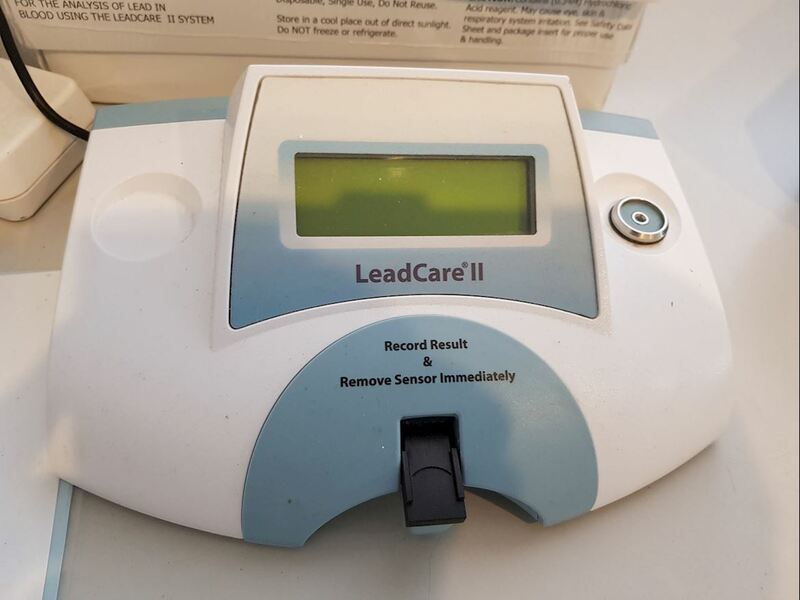 The absorbed lead competes with calcium causing neurological problems. The lead builds up in the bones. Lead decreases red blood cell production and increases blood destruction leading to anemia in the backyard birds. However, the clinical signs seen in the chickens are generally non-specific. Very few have all typical neurological or gastrointestinal signs. The results suggest that any chicken presented to a veterinarian with non-specific signs of illness that is kept in urban areas developed prior to 1940 may have some form of lead poisoning, whether or not it is the primary cause of the illness for which the chicken is presented for. Diagnosis of lead poisoning in chickens is based on blood lead levels. Prognosis of lead toxicity in birds is based on the red cell count, complete blood count, ,the presence of tremors or flaccid paralysis, and gastro-intestinal function - essentially response to Chicken vet treatments. Blood samples are tested at our Chicken vet focused clinic, on a blood lead machine. We need 1/20th os a ml of blood - that is collected and mixed with reagents and the result is available in three minutes - lead test results while you wait ! A positive result is a blood lead level over 10 μg/ dl (0.483 μmol/L). We test the blood at The Chicken vet Melbourne. Chelation with CaEDTA twice daily intramuscular injections is the primary therapy. fluids - fluid therapy possibly even drips, to treat the heavy metal toxicity and protect the kidneys. In heavy metal poisoning nerve damage occurs to some degree (neuropathy) , the degree of nerve damage is related to the level of PB in the blood, the delay prior to chelation therapy , the time before full clearance of lead from the body and the level of any residual lead in the blood, or even later rebound lead from the bone. Gastric erosion and ulceration is common so consider gastric protectectants like sucralfate though it's efficacy is really unknown. I am not aware of antacids being used to treat lead toxicity in birds. X-ray can being normal and normal X-rays are certainly no proof all the lead has gone. In waterfowl it is common for lead to be ground up, that doesn't mean it has cleared the body. Chelation therapy with injectable Calsenate is normally used, and continued for 5 days after all the lead particles have been removed. Even then it can take some time before nerve function normalizes in some cases it never does!! Client health is an important consideration in cases of high blood lead levels in backyard urban chickens used for egg production. The ingested lead is absorbed in the intestinal mucosa and then stored in the liver, kidney and bone (Bakilli et al. 1995). For domestic layer hens the lead will also be preferentially deposited in the egg shell and yolk. Blood lead levels in chickens directly correlate with lead levels measured in the egg yolk and are also increased in the shell . This correlation does not necessarily mean that ingested eggs will be toxic to humans, as that would depend on the number of eggs consumed and the weight of the owners. When high blood lead levels are present in chickens it is important to advise clients, especially those with children, of their possible exposure to lead. Exposure may be from their young children playing and eating the same soil as the chickens scratch in as well as the lesser possibility of exposure from eating contaminated eggs. Birds can still lay eggs with high lead levels - with the egg shell possibly having lead in it. After presonal communication with the DPI it may may be okay to eat the eggs ! The diagnosis of lead exposure or toxicosis in chickens is made on blood lead levels or kidney/liver tissue lead levels. Blood lead levels over 10 μg/dl suggest a significant exposure to lead and is likely to be the primary cause of clinical signs in both humans and animals (Needleman, Landrigan 2004). Levels above 14.5 μg/dl and certainly over 25 μg/dl in areas of high lead exposure confirm toxicosis in humans and animals. Radiology is non-specific and is unlikely to be useful as the sole method of diagnosing lead poisoning in chickens. Chickens, unlike parrots, are unlikely to break off small pieces of metal or paint from the house walls or cage wire that may be seen as radiodense particles on radiography. They are more likely to accumulate lead through foraging in the contaminated soil. This will not be seen as radiodense particles on radiographs. They may however, while foraging, peck and ingest, nails and screws nonspecific radiodense rocks and non-heavy metal metallic objects. These non-toxic objects may be difficult to distinguish on radiographs from heavy metal fragments in the ventriculus. Clinical pathology is also non-specific. In some cases hematology may show a hypochromic, regenerative anemia and possible erythrocyte "ballooning." Uric acid may also be increased on biochemistry (Fudge 2000). Treatment involves chelation with CaEDTA twice daily intramuscularly for a minimum of five days at 40 mg/kg (Dumonceaux, Harrison 1994). Hospitalisation and fluid therapy are often required. There was a poor response to treatment on chickens treated as outpatients on once daily 80 mg/kg CaEDTA. This once daily treatment was often used to improve client compliance at home. Failure to respond to treatment may also be related to the continued exposure to contaminated soil during and after the treatment period and other contributing illnesses present aside from lead exposure. The use of CaEDTA or any other medication in individual pet chickens used for personal egg production, as with any medication in food producing animals, is regulated differently in the various states in Australia. Similarly, the use of CaEDTA on other chickens within the flock without examination of each individual chicken is also regulated and may be problematic, depending on the interpretation of the various states'' and territories legislation. Chickens with high lead levels and clinical signs should be treated in hospital with fluid therapy and twice daily calsenate injections at 40 mg/kg. Treatment may need to be continued at this level or possibly less frequently until chickens can be removed from the contaminated soil. Consult state authorities on the use of medication in production animals kept as individual pets. A further study is recommended to assess the general blood lead level of both healthy and unwell chickens in inner city urban areas to determine the overall risk to pet chickens in older urban areas. Bird & Exotics Veterinarian, Chicken Vet.